La Pierre Verte is an amazing holiday camping site nestled upon the shores of the French Riviera. Offering an impressive 16 hectares of peace and relaxation, this luxury camping getaway is an excellent choice the the entire family. As always, please contact LUX-camp for more information. Why Should I Choose the Luxury Camping Site of La Pierre Verte? 150 private pitches with a choice of mobile homes. A close proximity to the beach. Please enquire with LUX-camp for questions regarding the availability of luxury mobile homes. One aspect that is certain to leave a lasting impression is the massive water park found within the confines of this holiday camping site. This large pool is open every day during the height of the tourist season. Children can enjoy a small paddling pool while adults will melt away their troubles thanks to a heated pool that provides 100 square metres of tranquillity. A large water slide, an outdoor sauna and an area dedicated for suntanning are also available within this luxury camping site. La Pierre Verte is known for the sheer variety of on-site activities that can be experienced during one's stay. 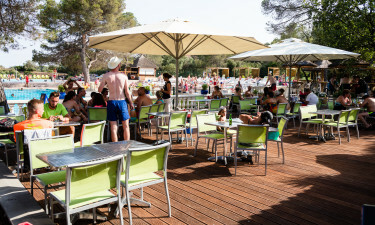 Some of the most popular include swimming, bicycle hire, tennis, table tennis and volleyball. Travelling just outside of this luxury camping resort provides further options such as sailing, surfing, diving and golf. We should also note that the trained staff at La Pierre Verte provides entertainment for children at no extra charge. La Pierre Verte truly aims to redefine camping luxury in these modern times. Guests can enjoy innumerable amenities such as wireless Internet, safety lockers, dedicated power supplies, water connections and waste disposal facilities. 50 cubicles for one's private washing needs are available while a fully equipped laundrette is always close by. Infant changing rooms are also present for those who plan on arriving with small children. Both a bar and a restaurant are found within this amazing location. Guests can choose to dine underneath the welcoming sun or enjoy their meal indoors. One interesting note in regards to this restaurant is that much of the entertainment will take place here during the evenings. Some examples include children's programmes, a cabaret and live music. This venue is ideally suited for any family that enjoys good food and a great ambiance. Anyone enjoying a memorable camping holiday should be provided with easy access to necessary provisions and other essential items. Fresh produce, toiletries, camping supplies and other items can be found within a grocery store only a short distance away from one's mobile home. Whether one arrives here for the unforgettable climate or the wealth of on-site activities provided, La Pierre Verte is a holiday opportunity never to be taken for granted. Please contact LUX-camp to learn further details or if you have any additional questions.